If you haven’t heard yet, Eric Clapton is having a 4th Crossroads Guitar Festival. This year’s festival will span two days at Madison Square Garden on April 12 and 13. Tickets have been sold out for a while. So why are we writing about this if you can’t get tickets? Because at the last two festivals Ernie Ball sponsored the Play Crossroads contest and they are doing it again this time. The festival so far has happened every three years. Both of the artists who have won the previous competitions have been featured on Blues Rock Review. For those who aren’t aware, in 2007, the winner was Tyler Bryant. It’s been a while since he played the festival but he is really starting to make a splash. Just read our review for his latest album. 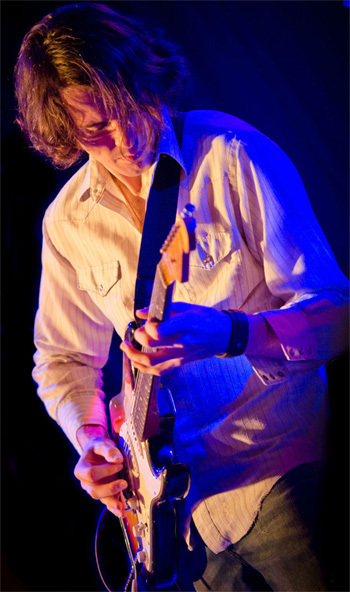 At the last festival in 2010, the winner was Ryan McGarvey. His recent release, Redefined, was reviewed by BRR last May. We had the opportunity to talk to Ryan about his experience at the festival. What were your thoughts/reaction in 2010 when you got chosen to play at the Ernie Ball festival stage? It was the thrill of a lifetime. I had entered the contest about 2.5 months late because I didn’t see myself standing a chance with so many from all around the world. When I was notified I had won, I remember literally jumping up and down in the hotel room that I was staying in. It was probably the single greatest moment of my life at that time. I don’t know if I could narrow it to just one best part. I know that for me I had always had a mental list of every guitar player I could ever hope or dream of being on the same bill with, and at the 2010 Crossroads, basically every one of those amazing musicians were all there, in one place. Part of the fun of the Ernie Ball side stage was all the spontaneity and collaboration between artists. Is there any performance from the 2010 festival either on the side stage or the main stage that really stands out in your mind? I think for me, Jeff Beck’s performance blew me away possibly the most that day. He just brought a ROCK power that I felt hadn’t been established that day yet. Of course anytime Eric would play I was just in awe of being in the presence. As far as collaborations, Steve Winwood’s playing, and versatility that he would lend to the songs he joined on really impressed me. It was great hearing him and Eric do some Blind Faith, as well as their version of Voodoo Chile by Hendrix. Did playing Crossroads open any Industry doors for you? It was definitely such an amazing addition to my resume that it helped get people’s attention for sure. Not just with overall music industry types, but in the guitar world of endorsements etc. that I had already been working hard towards for years prior to winning. Did you make industry contacts from the experience that you have stayed in touch with since then or that have been helpful with your career? Definitely. There’s people in different areas that we are still discussing working with in this way or another. And, like I said about the endorsements, the main one Ernie Ball/Music Man have just been nothing but the best to me, and helpful in every way that they can be. It all really was a stepping stone to take the next big step in my career from. Have you spent any time looking at the list of bands trying to get the honor of playing this year? I have. There’s really quite the number of people that I am 1) Friends with, 2) People that I admire, and 3) People I don’t think should really be in the contest, or I don’t feel need the platform (ha). It’s really great though that it’s all an even playing field no matter if you are a 16 year old that is in this from playing in their bedroom, to whether you are a veteran touring musician that has been doing this your whole life. Everyone has an equal chance. Do you have any favorites that you would like to see get the chance to play the festival? Like I said it’s really tough for me to get behind anyone in specific. I know so many in it this year. I think the most deserving will come out in the end, and really that’s all I can wish for. Really, I could put my own festival together of just the names I like from the contestants, and I think it would be a pretty rockin’ festival too. I agree. It would be awesome if the Ernie Ball stage was a full day of emerging artists. There are so many deserving artists in the competition this time. Any advice for whom ever gets to play this year? Just soak it in. Every memory from Crossroads is etched into my mind forever. It’s one of those times where even when you’re there – you know you may never get a chance to do something like it again. But, have fun and just take some moments to really appreciate where you are. Looking at this year’s list of main stage performers, is there anyone that you would particularly like to see? Is there anyone that you would really like to get up and play with? I think Clapton is THE guy. Really most any and all of the performers would be SUCH an honor. But Eric is someone I can relate to since I was little watching him on TV, and just to be able to trade licks with “God” would be something pretty hard to top. Take a moment to look at and check out this thread on our forum at some of the great artists that we have spotted among the entries so far. Then go to www.playcrossroads.com and scroll though the entries and see if you spot any great finds that we missed. While you’re there, throw your support behind the artists that you’d like to see get more exposure. Post your finds to the forum. Great article! Thanks for the feedback! We are trying to get in.